Fair enougn though i almsot feel i should argue against that course. The staves are meant to be more then mere weapons Eahc one is a GREATER Rune weapon theres an actual Intellect involved in them just touching them by a good character is a mega damage hit. Even the least intellgient of them (Wars Rune ball and chain) is an intelect 10 and diabolioc evil. these thinsge at solus for goodness sake. Pestillences actually summosn 3 120 MDC beetles that destroy stuff. The Atlatnis book goes on at length about how dangerous greater rune weapons are. I grant you though they do tend to run similar stats mainly iq various spells, mdc hits, and cats blasts from the skulls eye sockets save wars rune flail which extends to a 100 feet out. These guys are already clocking in at DCA Superman’s Power Level and with even bigger Power Point budgets. At a certain point, I just don’t feel like reading about yet another redundant attack or spell or special ability these guys have. So I break out the hand-wave. These guys are borderline Plot Devices anyway. also true enough, like I said it was more of a thought exercise due to the nature of the staves as evil living weapons, what agendas they might have that sort of thing, especially given that theyre millenia old and nearly as depraved and evil as their wielders. Well, there's always the option to write up these Rune Staves as their own characters. Involuntary Transformation: When subject to great stress or loss of emotional control, Prof. Beringei can transform into his "ape shape" without meaning to. Legal Status: Citizen of Canada with no criminal record. Prof. G. B. Beringei, Ph.D. M.D., GBE FRS FMedSci is a famous professor of anthropology and researcher into the effects of time-travel on the development of human civilization. Exposure to odd energies of a temporal anomaly have mutated his DNA, granting him the ability to transform into a super-strong, super-agile ape-like form. He fights crime. I didn't have to, a quick check confirmed that the species name of the mountain gorilla is derived from Friedrich Robert von Beringe, who shot two of them in 1902. G. b. Beringei is the subspecies of the mountain gorilla. Because puny names are fun. 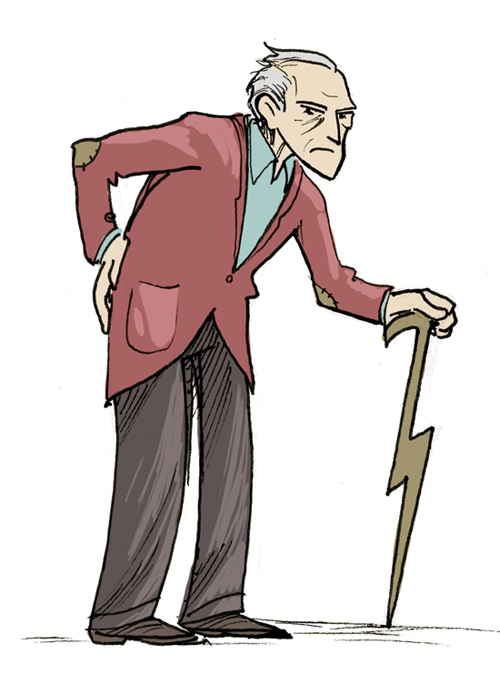 Geriatric : Sonny Thyme is an elderly man, with the health complications to go along with it. Power Loss: No Powers as Sonny Thyme. 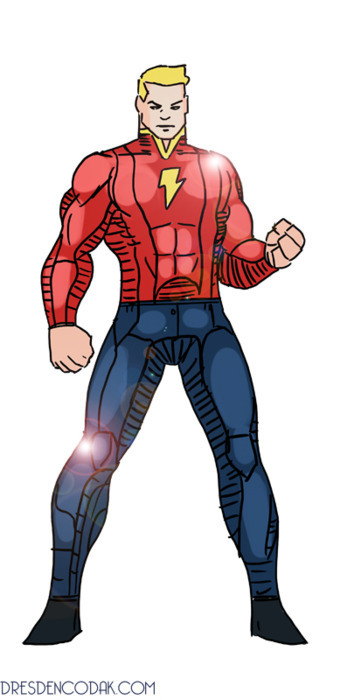 The Weather-Man can lose his powers if struck by lightning, exposed to significant voltage, or similar effects. Secret Identity: Sonny Thyme. In his nomral identity, Sonny has STR 0, STA 0, AGI 2, FTG 2, and PRE 3. He loses all Advantages, save Inspire and Leadership. Reinaldo Thyme, better known as Sonny Thyme, was a popular newsreader and meteorologist on the radio of San Diego. Updating the people of southern California with updates on traffic and weather every fifteen minutes for over sixty years. Upon his retirement, he and his beloved wife were honored by being grand marshals of the Thanksgiving Day parade and settled into a quiet retirement on the beach... Or so everyone thought. What no one knew was that decades ago, Sonny had been camping on the beach in Baja California, surfing, partying, and chasing waves with his buddies and his girlfreind. A freak thunder-storm chased the Sonny and his surfing buddies out of the water... But Carol, an inexperinced surfer, had trouble reaching the shore and got caught in a riptide. Sonny dove back into the water and swam out to her. Sonny got Carol to shore safely, only to be struck by lightning. The lightning passed through him and struck the sand, creating a nearly indestrucible fulgurite cane. Ever since that day, Sonny has been able to strike the glass cane against the ground, transforming himself into a handsome, atheletic paragon - the spitting image of himself the day he was struck by lightning. Last edited by Batgirl III on Mon Jun 04, 2018 4:16 pm, edited 1 time in total. Weather Man is the best Captain Marvel/Thor Expy I've ever seen. But Doc Kong is pure love. The character this guy reminds me of is Maximum Man from Wildstorm's 'Welcome to Tranquillity' series. A small, elderly chap who can transform into a superpowered young man. At times he rather abuses this power. 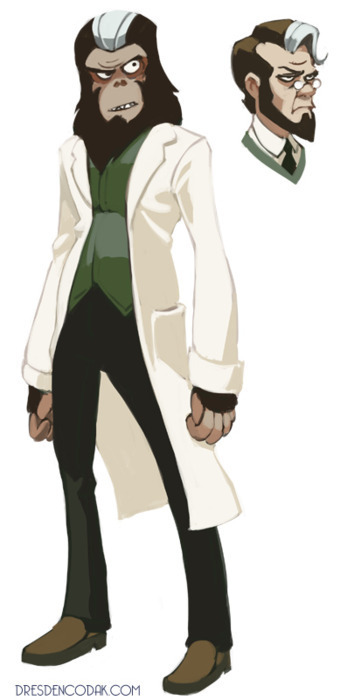 Doc Kong is the scientist ape I didn't know I needed in my life. Babylon 5 wrote: G'Kar: Would you like some spoo? It's fresh. Londo: Fah! Get that away from me. Spoo needs to age. It takes time to cultivate its flavour. To eat fresh spoo is to insult a Centauri. Spoo is/are (the plural of spoo is spoo) small, white, pasty, mealy critters, rather worm-like, and generally regarded as the ugliest animals in the known galaxy by just about every sentient species capable of starflight, with the possible exception of the pak'ma'ra, who would simply recommend a more rigorous program of exercise. They are also generally considered the most delicious food in all of known space, regardless of the individual's biology, almost regardless of species, except for the pak'ma'ra, who like the flavor but generally won't say so simply to be contrary. Spoo are raised on ranches on worlds with a damp, moist, somewhat chilly climate so that their skin can acquire just the right shade of paleness. Spoo travel in herds, if moving a total of six inches in any given direction in the course of a given year can actually be considered moving. They stay in herds ostensibly for mutual protection, but the reality is that if they weren't propped up against one another, most of them would simply fall down. They do not howl, bark, moo, purr, yap, squeak or speak. Mainly, they sigh. Herds of sighing spoo can reportedly induce unparalleled bouts of depression, which is why most spoo ranchers wear earmuffs even when it's only mildly cold, damp, wet and dreary outside. If there is any life-or-death struggle for dominance within the spoo herd, it has not yet been detected by modern science. Spoo ranching is one of the least regarded professions known. Little or no skill is required, once you've got a planet with the right climate. You bring in two hundred spoo, plop them down in the middle of your ranch, and go back to the nearby house. Soon you've got more. When it comes time to cull out the ones ready for market (the softest, mealiest, palest, most forlorn-looking spoo of the pack), little physical effort is required since they're incapable of rapid movement without falling over (see above). They do not resist, fight, or whine; they only sigh more loudly. When spoo harvest time comes, the air is full of the sound of whacking and sighing, whacking and sighing. Even an experienced spoo rancher can only harvest for brief periods of a time, due to the increased volume of sighing, which even the sound of whacking cannot altogether erase. (also see above) Some have simply gone mad. Spoo are the only creatures of which the Interstellar Animal Rights Protection League says, simply, "Kill 'em." Fresh spoo (served at an optimum temperature of 18° C / 62° F) is served in cubed sections, so that they bear as little resemblance as possible to the animal from which they have just been sliced. Spoo is usually served alongside a Chablis or a White Zinfandel. Further information on the care, feeding, eating and whacking of spoo can be found in the second edition of the Interstellar Guide to Fine Dining.